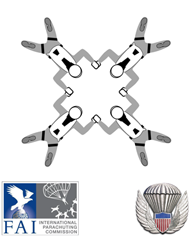 Draw Generator for Skydiving Disciplines by AXIS Flight School, LLC at Skydive Arizona. This tool works like an electronic whiteboard that gives you complete control over the dive flow. It should only be used at the discretion of a competent coach. You can configure up to 10 rounds. Randoms and blocks can be used repetitively. Enter formation numbers and letters (not case sensitive) separated by any non-alphanumeric character (CISM: Star is supported; e.g. Star-F-B-8). There are no checks for errors of any kind. Up to 5 or 6 scoring formations per round can be entered. Longer input strings get truncated. i.e. without the hyphen in their names!